To freeze vegetables is the simplest way to preserve their summer goodness. Vegetables picked at their peak, blanched then quick frozen, do not need any special equipment to do successfully. Vegetables need to be blanched before freezing. This stops enzyme activity and retains their colour and flavour. Not all vegetables are suitable for freezing. See the listing below for the most common vegetables to freeze. Always select and freeze vegetables at their peak as soon as possible after harvest. Prepare them as you would for cooking. Wash in cold water to remove dirt, then peel, slice, dice, chop, whatever. Use a wire basket or cloth for cleaned vegetables and plunge them into a pot of rapidly boiling water. Don't try to do too many at one time or the water will take too long to return to the boil and your timing will be off. At the end of the blanching time, lift the vegetables out of the pot and plunge them into ice-cold water. Make sure they cool right to the core before removing or they will continue to cook. Once well drained, pack into containers (zip lock bags are good). Only pack one 'meal size' at a time and make sure you remove as much air as possible from the bag before sealing. 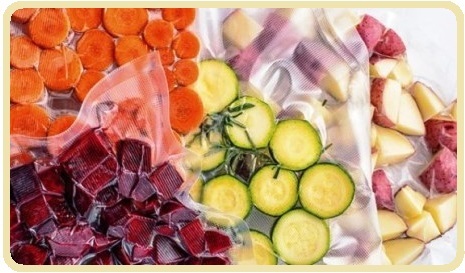 When freezing vegetables, place bags in freezer as soon as possible after packing, and don't stack them together at first, as this will delay the freezing time of the inside bags or containers. Most vegetables will keep in a freezer for 10-15 months. Remember, frozen vegetables should be cooked without thawing, otherwise you're looking at mushville with a capital M! Do not try to refreeze vegetables that thaw... it completely ruins them and you may introduce dangerous bacteria.